Better support for extremely large boards. Minesweeper X has always made the claim that "You are only limited by the size of your screen" and some people have used this feature to play on utterly gigantic boards. Since I never expected people to play on such extremely large boards, the number of mines in a game was previously capped at 9999; this has now been increased. Option to have Minesweeper X notify you with a pop-up when you set a NF or 3BV/s record. Since these records are read from stats.txt, auto-saving of statistics must be enabled for your records to be remembered between playing sessions. Option to have Minesweeper X save "session statistics" about how many games of each type were won and lost in each session, as well as when the session started and ended. A better random number generator is used for board generation. The help file has been moved online. Mouse behaviour which more accurately follows the original Minesweeper's behaviour in certain obscure situations. August 24, 2011... Version 1.15. To guard against poaching of videos, a player name may now be saved inside recordings (which remain backwards compatible). For lack of a better place, the name to be saved is set inside the auto options window. Also, pressing R is now a shortcut which will restart a recording being playing and also save & replay a game just finished. September 16, 2010... Version 1.14.2. Embarrassingly, the last patch introduced a regression concerning the Solved 3BV counter, so another patch is required. September 13, 2010... Version 1.14.1. Annoyingly, in 1.14 the 3BV would not be calculated in autosaved stats. Thanks to KAmil for finding this so fast. September 12, 2010... Version 1.14. This is an update designed to smooth over some rough corners which have become evident over the past few years. All bugs known to me have been fixed, including a crash on board widths larger than 135, an issue where the LED timer would not immediately update on the game end, and missing AM/PM designators in the time. Additionally, videos can now be played by dragging them onto the Minesweeper X window or executable, and MVR files may be associated with Minesweeper X. Finally, some restrictions have been relaxed (now videos may be up to 10,000 seconds and mines may cover 99% of the board) and some new settings are remembered (the position of the Statistics Window and the Marks option before playing a video). Also, I just noticed the Win 98 guessing smiley has lighter shading than the Win XP one. February 26, 2006... Version 1.13.1. After rushing out yesterday's update, I realised that a few borders wouldn't display correctly on small board sizes. Oops. It's fixed now. I also updated the skin elements picture if anyone is planning on making their own skin. February 25, 2006... Version 1.13. I wasn't planning on updating just yet, but I noticed Minesweeper X got posted on LUElinks, so I figure I might as well release it now if some people are actually going to use it. The update isn't anything major, but there are a few speed improvements again, and an occasional bit of flicker when depressing cells no longer occurs. Also, I noticed that in the original Minesweeper, clearing large patches of zeros occurs somewhat spiral-like around your cursor. To be completely faithful to the original, I determined the exact order in which the cells are cleared and implemented it in Minesweeper X. 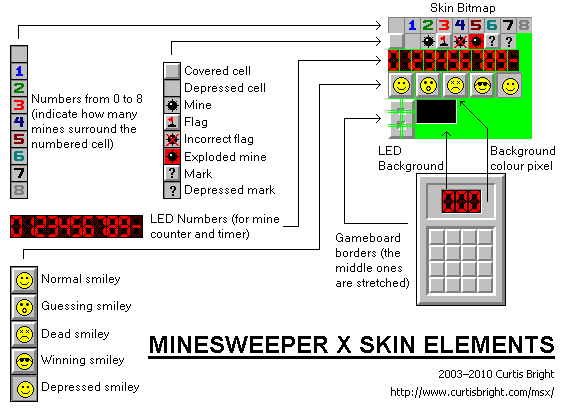 Also, previously in Minesweeper X using the middle mouse button would always result in 9-depressed cells, but in the original it may change if you press another button at the same time. In 1.13 it now follows what happens in the original. December 3, 2005... Version 1.12. Very minor update. The statistics window is now no longer "always on top". (It wasn't really necessary, and was annoying sometimes.) Also, now when loading or saving a file the main window doesn't disappear. November 17, 2005... Version 1.11. I added in the "automatic shutdown timer" option and cleaned up a few things. March 24, 2005... In Version 1.04, I changed a few minor things. Because videos made on huge custom boards would play very slowly, I have disabled recording while on a custom board. December 20, 2004... There hasn't been much interest in Minesweeper X, so I haven't bothered adding in new features. I am only releasing Version 1.03 to fix a small bug I found. When playing videos, you should not be able to change the Marks option. Version 1.02 was a minor update released on March 22, 2004. For now the timer will refresh only 40 frames per second on Win XP. Recorded videos should also be a little smaller now. Version 1.01 was released on March 18, 2004. Videos recorded under Win XP will play fine on slower computers. Computers running Win XP will update the time 100 times per second, but other computers will update the time about 20 times per second. Also, the cursor in the videos has been cut to a smaller size. Version 0.01 was completed on January 25, 2003, and since then the program has developed to what you see today. Many different 'cheating' options and other advancements were added until Version 0.34, which was released on January 31, 2004. The old version is still available here.